Being located at the crossroads of the major Eurasian transport corridors, with huge resources and an important growth rate, Azerbaijan has now the opportunity of putting in practice his objective of becoming a regional hub between Europe and Asia. Having chosen the Western direction, Azerbaijan is involved in large-scale projects of European interest and the East-West Black Sea Caspian Sea Corridor must not be absent from Baku’s plans. Choosing to be part from the East-West Strategic Corridor linking Central Asia to the Euro-Atlantic Area and implicitly, to collect the economic and strategic advantages that come along with it, Azerbaijan will strengthen its position in the Caucasus and its role of stabilizer in the region. Azerbaijan is facing now one of the most important windows of opportunity from this period of its independent history. Situated in the Caucasian Regions, on the shores of the Caspian Sea, rich in oil and gas offshore resources in a period of economic crisis in the World and a crisis of Sovereign Debts in Europe, at the end of military interventions in Iraq and Afghanistan and in the framework of a controversial Iranian nuclear issue, Azerbaijan is able to offer the suitable conundrum of solutions for several key world players and to value its position and assets for increasing its own security. There is a traditional approach in the realpolitik characteristic to the geopolitics and the policies of the countries from the post-Soviet space. The World is seen as organized on different tracks according to the “power” that each member state enshrines in itself and projects around it – be that in terms of Authority, Resources or Prestige, status and influence capabilities. In that respect, we do have Great powers – during the World Wars Period, than the two Superpowers – during the Cold War, now a Superpower and Hegemon – The US, after the fall of the Cold War, debatable in terms of military capabilities, economy or capacity of projection around the world versus the will to assume this status. But in our very region, in the Euro-Atlantic reality, the relevance begins to be more and more that of the Regional powers – EU itself, Germany, France or Russia, Turkey and Iran. And, more and more, a special role has been attributed to the countries that do not assume any Regional power status, but succeeded in increasing their strategic profile, secured a regional important role, took advantage, at suitable moments, of their geography and resources in order to have arguments to claim the respect of their opinion, the respect for their national interests in their respective region, not talking about the respect of their independence, territorial integrity and sovereignty. Those are the minor powers. In that theoretical framework, we can asses that Azerbaijan is such a minor power of the Caucasus Region, of the Caspian Region, of the Euro-Atlantic area. This posture is granted through some very important assets that Baku can put on the table: huge resources and an important economy, with an important growth rate, military capabilities important for its dimensions and the needs to ensure its defence, a valuable policy of balanced approach to the World and a position to be valued on the East-West Strategic Corridor from EU-NATO to Central Asia via the Caucasus. First, the balanced approach is given by the relations that Azerbaijan defines towards the powers of the World and the powers of the region. It is in the best relations with US and NATO, with an important contribution to the theatres in Afghanistan, but also ensuring the transit corridor for troops, weapons and supplies for NATO troops. At the same time, the East-West Corridor is designed for civil and commercial transport, and the trade old Silk Road is still in the minds of the principal beneficiaries of such a corridor, namely the European Union and countries from the Asian East, first and foremost India and China. Moreover, it is an important entering point and transit space for the Southern EU Energy Corridor, a strategic project of the post/modern integrated neighbour on the other side of the shores of the Black Sea. 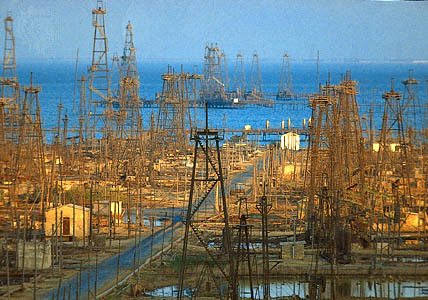 It has an important relation with Russia, sharing common history and commercial ties, but also maintaining its individualism, defending its positions in key issues for national security in the delimitation of the economic exclusive zones in the Caspian Sea and the options for alternative routes and distribution networks for its oil and gas. Second, a good relation and balanced approach is developed in relation with the regional powers. Iran is a difficult neighbour, with its controversial nuclear program, its approach to the politics of power, but Azerbaijan succeeded to have a balanced approach enabling it to maintain the link by road and train with the Nakichevan region and refraining from entering into the logic of confrontation even in worlds with Tehran. Moreover, Azerbaijan also keeps other leverages that are important for the bilateral relations. Azerbaijan is a Muslim country. This is an added value of first importance and relations with its brothers from Turkey as with other countries are encouraged by this reality, that could also help in opening markets usually closed to other countries, niches that could be taken by Baku’s administration. An important role could be developed, as well, in the neighbouring Northern Caucasus region, in stabilizing it. All those added values are used and could offer new opportunities in the existing situation at the international level, economic crisis, Arab Spring, state building after wars in Iraq and Afghanistan, projects to build alternative routes and alternative sources for the oil and gas towards industrialized Europe and possibilities to get from there transfer of technology for diversifying the economy. The scheme of values strengths and opportunities could be completed by assessing Baku’s relations with its neighbours East and West, along the Corridor. And there is also an added value to be used extensively. First, it is about its relations in the Caucasus region with Georgia. This good relation as well as several energy projects, investments in its neighbour and support are of great importance. BTC, BTE, the AGRI project are at the same time projects that link countries in the region and solve the equation of resources for the EU and NATO countries. Whatever project will be chosen in the auction related to the 16 bcm of the Shah Deniz phase 2 would be of great help for the support to the Strategic Corridor of the EU. It will link Azerbaijan with Turkey and Romania, and it will bring oil and gas in the EU. And the SOCAR program of investments in both countries ensures the capacity of being involved in downstream operations, as well as, directly inside the EU and NATO. Then we have the relations with countries on the other side of the Caspian Sea – Kazakhstan and Turkmenistan. In spite of the unresolved issue of the delimitation of the exclusive zones with Turkmenistan, trade and energy relations are very good and Turkmen Oil is floating towards the West, as gas should arrive at the possibility of floating, in a Transcaspian pipeline. And the differences of view of other actors in the Caspian Region on the statute of the Sea, and the delimitation of the economic exclusive zones should not harm trade and energy extraction. On the contrary, economic activity and businesses are good common projects that could settle unresolved conflicts in the area, as it did happen not far, in the Black Sea, between Romania and Ukraine: both states agreed to solve the delimitation of the economic exclusive zones in 1997, through the bilateral agreement, in front of the Hague International Court if a solution could not be reached bilaterally in due time. And three years ago, the International Court offered a solution that solved an issue which could not be achieved in some 40 years during Communist times between the superpower Soviet Union and the minor power of the same Communist block, Socialist Romania. The two independent countries solved the issue and now take profit of the reserves of oil and gas in their respective offshore, that they couldn’t exploit for 50 years and more. Nagorno Karabakh is the hardest security issue unsolved in the region by Azerbaijan. But its behaviour in the other most important subjects and taking opportunity of the advantages that the East-West Corridor can offer in transit, transportation – military and civilian – and Energy can fill the gap. Violence is not a solution and the existing format has its limitations. Moreover, the trial of moving in a 1 plus 2 format sponsored by Russia proved to be a dead end, and the return to the Minsk Group mediation should be the solution, by involving more partners that Azerbaijan has in the world and in the region. The NATO summit in Bucharest stated, in its final declaration reinforced every summit until Lisbon, the support for political independence, territorial integrity and sovereignty of Republic of Moldova, Georgia, Azerbaijan and Armenia. Moreover, the NATO-Russia Council assumed, under the signature of the 27 plus one members (NATO member countries and Russian Federation) the support for all the Euro-Atlantic Countries’ territorial integrity, sovereignty and independence. That is the most credible guarantee for a peaceful solution in Nagorno Karabakh according to the stated principles, internationally accepted and reflected in the proposals for the Madrid principles. The special role that Azerbaijan has in the transit of ISAF supplies to the operation Theatre in Afghanistan is of tremendous importance and could constitute the second strategic guarantee for the support of a solution based on the international law principles in Nagorno Karbakh. And thirdly, the direct contribution of Azerbaijan with troops in Afghan operation and in other international missions is another brick in the solid establishment of an international support for a fair and stable solution in Nagorno-Karabakh, with respect to the principles established by the United Nations and OSCE Helsinki conference. * Iulian Chifu is a specialist in conflict Analysis and Decision Making in Crisis. He is an associated professor at the National School for Political and Administrative Studies Bucharest and chaired the Conflict Prevention and Early Warning Center Bucharest. He is currently the Advisor of the Romanian President for Strategic Affairs, Security and Foreign Policy. Turkish public sensitivities and political outreach towards the Muslims of the Caucasus region have always been there. However, this general sympathy has been channeled into more concrete involvement and has had more effect in recent years. More than 20 years after Azerbaijan’s independence from the Soviet Union, and 10 years of Turkey being governed by a relatively more „religiously informed” government than was the case in Turkish Republican history, this article examines the changing role of religion in Turkey-Azerbaijan relations. Turkish involvement in religious affairs in Azerbaijan is done primarily through two channels – one is the official Directorate of Religious Affairs in Turkey and the other is the Fethullah Gülen movement, also called the Nurcu’s because the Gülen teachings draw on Said Nursi’s writings. The Turkish Directorate of Religious Affairs has financed the construction of a number of mosques (eight according to most sources) and trains clergy from Azerbaijan in Turkey, as well as setting up schools in Azerbaijan to train clergy – in collaboration with the Turkish Ministry of Education and Foreign ministry. The work of the Gülen movement is harder to qualify or quantify – and its interaction with government policies also much more complex. The Gülen Movement was founded by and is led by a Turkish Islamic scholar/preacher named Fethullah Gülen who lives in Pennsylvania. Through companies, education institutions (schools and special training courses), dormitories, media outlets, and political connections, the Gülen movement’s presence in Azerbaijan has been growing consistently since Azerbaijan’s early years of independence. Across the country, they include primary and secondary schools, university preparation courses, and one university. Perceptions of this movement in Azerbaijan vary widely and are assessed from various sides in this article.